DO YOU LIVE OR FARM IN THE ROGUE OR INDIAN MILL CREEK WATERSHED? THERE COULD BE FUNDING FOR YOU! Keep your soil and your money on your land through a special funding source available over the next four years. A project is now accepting applications for conservation financial assistance. 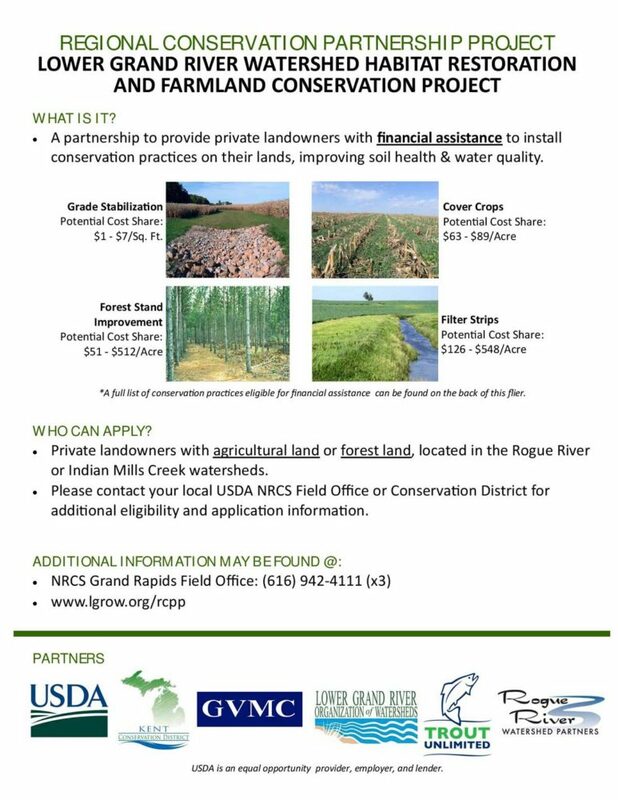 Landowners and agricultural producers in Indian Mill Creek and Rogue River Watersheds in Kent, Montcalm, Newaygo and Ottawa counties are eligible to apply at their local office of the USDA Natural Resources Conservation Service. Conservation financial assistance through the Lower Grand Partnership Project is available for implementing a variety of designated practices (~57) to improve water quality and wildlife habitat. Some of these practices include; utilizing cover crops, conservation crop rotation, establishing vegetation for wildlife and pollinator habitat, vegetative filter strips and field borders, forest stand improvement, grassed waterways and nutrient management plans. Call NRCS today for more information or to schedule a free, confidential site visit at (616) 942-4111 ext. 3.